COCINA: cocina bien equipada con lavavajillas, lavadora, congelador, horno, encimera de gas, nevera-congelador, microondas, cafetera, tostadora, cafetera y muchos extras incluidos. Mesa y sillas para 6. Caja térmica / bloques previstos para las comidas campestres. SALÓN: aire acondicionado, dos sofás, TV, reproductor de video, reproductor de DVD, reproductor de CD / radio. Reino Unido IPTV Streaming TV, TV vía satélite europeo, Televisión Española, chimenea de leña (utilización de Invierno) y calor / aire acondicionado frío. Muchos libros, juegos, juguetes, información turística, muchos mapas de áreas locales, diccionario, libro de frases, menús e información, revistas sobre el área. DORMITORIO 2: Una habitación con dos camas. Armario y almacenamiento y Toy Box completo. Fan. DORMITORIO 3: Aire acondicionado Dormitorio con cama doble (y Cuna / Equipo instalado cuando sea necesario), armario, cajones. Totalmente equipado mosquiteros y puertas mosquiteras en todas partes. Familia baño: Baño con ducha, lavabo y WC. Secador De Pelo. Power point, calefacción. EQUIPAMIENTO ANTIGUO: 2 cunas, 2 tronas, mecedoras para bebés, cochecito grande para bebés (con sombrilla), cochecito para paraguas pequeños, andador para bebés, orinal, soporte para bebés para el baño. Todas las sábanas y toallas de baño y toallas de playa incluidas. Todas las camas en cuna proporcionada. Paños de cocina, manteles, pestañas lavavajillas, equipo de limpieza, detergente, jabones de mano, muchos lujos adicionales proporcionados como estándar. EXTERIOR: Aparcamiento vigilado para coches, Piedra barbacoa, mesa y sillas para 6, zona de comedor con sombra bajo gazebo en patio elevado, tumbonas, juego seguro para los niños (llave la puerta de la piscina y zona de terraza). La piscina privada y aislada es completamente de azulejos y aproximadamente 8 x 4 metros con un montón de espacio para nadar y disfrutar de un refrescante chapuzón en los meses de verano. La parte más profunda de la piscina es de 2. 6m con un trampolín. Hay pasos incorporados en un extremo y también una ducha exterior. La piscina se encuentra en una de azulejos (antideslizante) terraza y ofrece privacidad, ya que tiene las paredes de todas las partes. Esto lo convierte en una trampa solar regular y protegido del viento. La zona de la piscina / terraza tiene muchas hamacas. Mesas supletorias y sillas se proporcionan bajo la zona de porche con sombra. Seguridad exterior se conecta para que pueda utilizar sus ordenadores portátiles y teléfonos móviles! WiFi disponible en la piscina. Placas de seguridad no se puedan romper y tazas / vasos están previstos para sus aperitivos y bebidas que se tomen en la piscina. La piscina también tiene luces y se puede utilizar para que nadan noche. Las luces también ajustaron a terraza y porche. Se proporcionan ayudas de flotación, anillos de natación y brazaletes para que los niños los usen de forma gratuita. También sombrilla y sillas para la playa, baldes, palas, etc. Amplio y luminoso, gran capacidad de almacenamiento. Schöne Unterkunft, alles sauber und ordentlich. Thank you for choosing to stay in Las Mariposas. I am pleased it met your expectations. Great pool and pool area. House clean and kitchen very well equipped. Mandy the host very helpful. The villa was very quiet and peaceful. 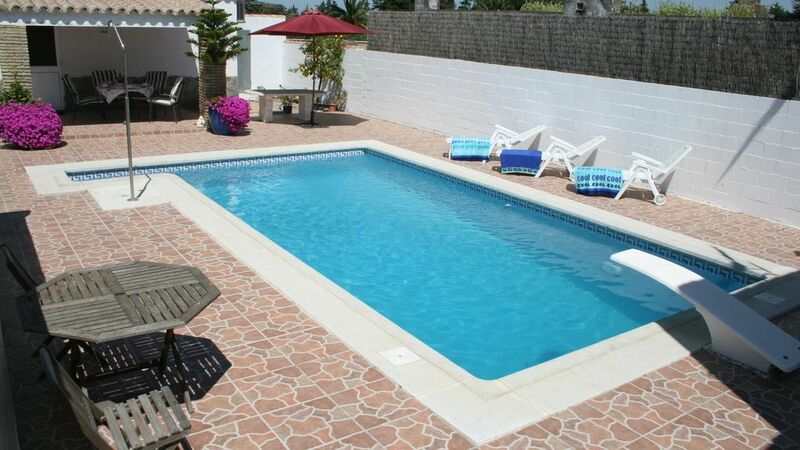 Lovely large pool and plenty of sun loungers and shaded veranda for those who wanted to stay out of the sun. The surrounding area was mainly farming land and housing - no village to speak of. There were a few restaurants and bars within walking distance - the most local restaurant (just a couple of minutes walk) had really good and inexpensive food and a good atmosphere. The area surrounding the villa was unfortunately quite scruffy - big refuse bins at the end of the road and lots of rubbish surrounding the immediate area. This in no way detracted from the villa when you were inside the walled area of the villa and pool. The villa itself was comfortable and clean. The kitchen was very well equipped and had everything you could possibly need. I would suggest to Mandy (the owner) that she invests in some new towels and bedding. The towels and bedding supplied were clean but definately past their best - nice towels and bedding make a huge difference to your comfort when you are on holiday. Mandy was a great host - we arrived late at night so she had got some basics in for us for the following morning. She gave us useful information about the area and was there if we needed her. Although she lives in the villa next door we did not see her unless we needed something. She was extremely considerate to her guests. You certainly need a car if you are staying at this villa - the beach area is about a twenty minute drive away and the supermarkets are a good 15 min drive away. There are some interesting places to visit within easy driving distance - Cadiz (the old town in well worth a visit), Vejer- again well worth a visit. For the evenings we enjoyed going to Conil de la Frontera - a very spanish seaside resort about 15 mins drive away. It had a lovely atmosphere on an evening - busy with a real buzz about it. Loads of restaurants and bars to choose from on the narrow streets - well worth a visit. We flew into Seville and it was an easy drive down to Chiclana - about 1 1/2 hours. Overall we had a really good week with the weather being extremely kind to us. Thank you for your review. I am glad you enjoyed your stay and, as you say, you were extremely lucky with the weather. There are supermarkets nearer to the villa but I try to send clients to an area where there is a choice of 2-3 all clustered together, variety being the order of the day! The Bath towels were new as of August 2018. I also provide hand towels, tea towels and beach towels at no extra cost. I also provide the option of a late (free) check in and always ensure there are supplies for my late arrivals. In this area of Spain the large refuse bins/bottle bank/cardboard/plastic recycling are placed at the ends of the road and at weekends during the summer get over used. They are emptied out daily and sprayed with disinfectant regularly. Bed linen is replaced on a frequent basis. We loved it. Very nice, clean and well equipped. The owner was very nice. Thank you for choosing my villa to stay. I am glad you had a lovely holiday. I hope to see you again. We really loved staying at Las Mariposas villa. The kitchen was well equipped with fridge freezer, freezer, cooker, microwave, dishwasher etc. Although we didn't use the television and video much, it was really good, with a big screen that Dad could watch the football on. The Wi fi was also very useful.The board games and books were great and the information about the local area and Andalusia in general were very helpful. We used the barbecue several times during our stay and ate outside on the patio which had a table with a lovely table cloth with butterflies (Mariposas) on. It was fabulous to have our own swimming pool which was secluded and was overlooked by no-one. The body boards and floats provided by the villa were a lovely touch and we enjoyed playing with them. Mandy welcomed us with wine and beer and other bits and pieces which was very nice of her. The bedrooms were comfortable and it was great to have en-suite facilities as well as the main bathroom. The air conditioning kept us cool at night. Pago Del Humo is a little bit out in the sticks, but we did have a walk to the Venta Florentina for some lovely food. Chiclana is just a short drive away with it's choice of supermarkets and other shops. The beaches at La Barossa, Sancti Petri, Conil and San Fernando were lovely and we enjoyed our adventure in the kayaks at Sancti Petri. Cadiz is just a short drive away and there was lots to do there including visiting the Torre Tavira tower with its Camera Obscura which was amazing. Jerez and Seville were a bit further to drive but well worth it as we saw a horsemanship show, visited the zoo at Jerez and visited the biggest Gothic cathedral in the world at Seville. A good family holiday enjoyed by all. Throughly enjoyed the villa, was very relaxing, had everything we needed, and situated in an area close to everything! I am so glad that your holiday was such a success. I hope to see you again.The wee doggies were cute. Thank you for being such lovely clients. Merci Tarek et Yasmina pour une belle critique. Je suis impatient de rencontrer vous et votre famille à nouveau. Je suis ravi que vous ayez apprécié votre séjour. Voyage en toute sécurité en Belgique. La villa Las Mariposas se encuentra en una ubicación central, lo que permite una libertad refrescante y flexibilidad. Está situado en una tranquila y apacible calle residencial, pero a sólo 5 minutos de la bulliciosa ciudad de Chiclana de la Frontera. La zona de Pago del Humo con su propio pub / restaurantes, mini supermercados con pan recién horneado, farmacia, otros servicios están a la mano y el pueblo permanece abierto todo el año. La villa está a 15 minutos en coche fácil a las playas de arena muy limpias. Incluso la playa más popular de 'La Barrosa' en la temporada alta, tiene un amplio aparcamiento de coche barato al lado. En cuanto a la zona de la playa en sí, un montón de espacio para distenderse y relajarse. Hay bloques sanitarios limpios y aseos y también salvavidas están en servicio en temporada alta. Roturas de ciclo corto y fuera se están convirtiendo cada vez más popular, donde se puede disfrutar de una propiedad con cocina a la vez tranquilo y sin prisas del año. La primavera y el otoño son un tiempo muy agradable en el que explorar la zona de Cádiz. Este es el momento ideal para ir a dar un paseo por el campo para ver la fauna y la flora. Tener excursiones de un día y explorar los hermosos pueblos en Grazalema, Vejer de la Frontera, Ronda, Antequera, Barbate, Conil y el Cabo de Trafalgar. Visita Tarifa y maravillarse con los practicantes de kite surf y viento. Caminar por las ruinas romanas de Bolonia, visite el impuesto paraíso de compras gratis en Gibraltar y visitar los simios. Disfruta de la naturaleza en su máxima expresión en esta parte relativamente virgen de España. La maravillosa ciudad de Cádiz, a poca distancia, es una visita obligada en sus vacaciones en Andalucía, Costa de la Luz. La antigua ciudad se encuentra a unos 3.000 años de antigüedad. Cádiz es una ciudad muy relajado y fácil de llevar. La gente se sienta afuera en los cafés de todo el día disfrutando mucho la brisa del mar fresco y cálido sol, mirando a la arquitectura morisca. El casco antiguo es probablemente la más hermosa con las mansiones de comerciantes de antaño, torres, plazas pintorescas son sobrecogedoras. Visite un anfiteatro romano, admirar las influencias moriscas. Visita la gran Catedral o los enormes árboles Ficus en los parques y jardines con loros salvajes. Tienda en la principal plaza / plaza, disfrutar de un helado o tapas en esta hermosa zona. Cádiz está tan cerca de mis villas de vacaciones que muchos huéspedes eligen pasar más de un día visitando Cádiz. Sevilla es conocida como la ciudad cultural de España. Se trata de una hora en coche. O se puede aparcar (gratuitamente) en la estación de tren local y por un precio moderado dejar que el tren te lleva al centro de Sevilla. Qué hacer en Sevilla son la Catedral y la Giralda, los bares de tapas de Barrio Santa Cruz, los Reales Alcázares, las ruinas romanas de Itálica en Santiponce, ver la espectacular Plaza de España, tomar un barco por el río o caballo y viaje del carro. Lleve a los niños al parque temático Isla Mágica (Alton Towers de Sevilla) o visitar uno de los tablaos de la ciudad y disfrutar de un espectáculo de flamenco. Para las personas que aman la naturaleza - todo está aquí. El famoso parque de Doñana la naturaleza con sus flamencos rosados ​​está cerca. La forma más fácil de explorar esta reserva natural de las villas de alquiler Explorechiclana es conducir a Sanlúcar de Barrameda y la captura de un pequeño ferry pies de pasajeros a través del río Guadalquivir a la reserva natural. Senderos fuera de la carretera para los caminantes son abundantes. Son el antiguo Cañadas (formas drover) que, en el pasado, los arrieros de ganado traerían su ganado al puerto de Puerto de Santa María a la provisión de los buques en los días de los conquistadores. Los observadores de aves podrán ver buitres grifo, cigüeñas, cernícalos, halcón, flamencos rosados ​​y muchas otras especies. Las playas no son para todos. Esta zona está llena de cultura, historia, pasear, hacer senderismo, montar a caballo, deportes acuáticos y golf. Las villas de alquiler tienen una ubicación céntrica para muchas excursiones diarias fuera. La ciudad de Jerez está a 30 minutos en coche. Haga un recorrido por una de las famosas Bodegas de Jerez y ver cómo se hacen Jerez y Brandy. La ciudad está llena de lugares históricos y artísticos, un día no es suficiente !! Visita el Alcázar árabe y los jardines, el Museo del Reloj, iglesias del siglo 15, el Museo Flamenco etc. Los caballos que realizan de Jerez son una maravilla para la vista. Para los entusiastas de los deportes de motor visitan la famosa pista de carreras. Fórmula 1 prueba sus coches aquí y el Moto GP es normalmente el primero de la temporada. I have total liability insurance, carry the necessary Energy Certificates and have legal electricity. The villa is set is a quiet street, near to village amenities. Free WIFI, Air Conditioning, Private and Exclusive use of pool. GPS/Road directions sent once a booking has been made, always someone to meet and greet you. Many tourist leaflets, many maps and guide book. Fire Extinguishers and First Aid Box. Owner on hand to help with making appointments, hospital/clinic visits. Fully registered.